Taken in the Wind Rivers, WY, last thanksgiving if I recall! Great find and I love the treatment here-perfect! Amazing! I see an image like this and stories begin to go through my mind. I wonder why someone chose this place to leave the truck – or did they even have a choice? What a great find, and a beautiful photograph! Do you process your own film? What a treat to find this on our shelf. Great BW. This does suggest an interesting story. Love the lighter bottom right and top let corners, Creates a great diagonal. Wonderful b/w picture. The abandoned valley fits with the wreck. Wow. Such an incredible find. 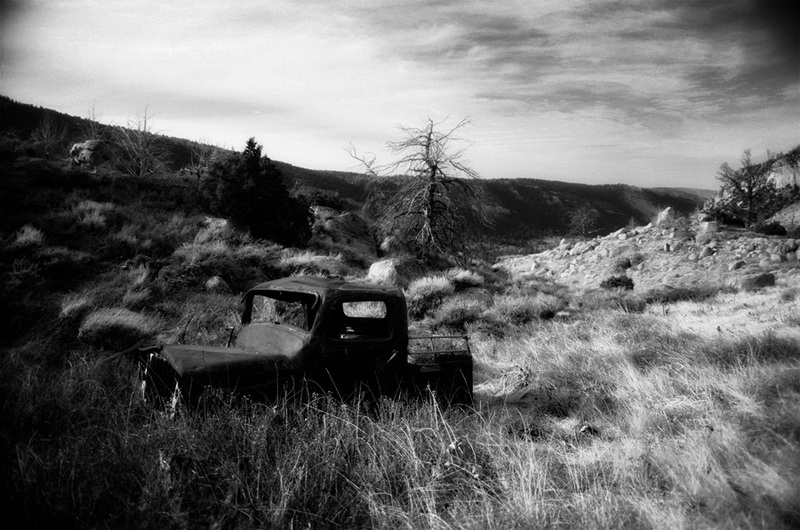 beautiful shot…that old car couldn't be better positioned.